This example shows a model parity-equations based approach for detection and diagnosis of different types of faults that occur in a pumping system. This example extends the techniques presented in the Fault Diagnosis of Centrifugal Pumps Using Steady State Experiments to the situation where the pump operation spans multiple operating conditions. The example follows the centrifugal pump analysis presented in the Fault Diagnosis Applications book by Rolf Isermann . It uses functionality from System Identification Toolbox™, Statistics and Machine Learning Toolbox™, Control System Toolbox™ and Simulink™ and does not require Predictive Maintenance Toolbox™. The steady-state pump head and torque equations do not produce accurate results if the pump is run at rapidly varying or a wider range of speeds. Friction and other losses could become significant and the model's parameters exhibit dependence on speed. A widely applicable approach in such cases is to create a black box model of the behavior. The parameters of such models need not be physically meaningful. The model is used as a device for simulation of known behaviors. The model's outputs are subtracted from the corresponding measured signals to compute residuals. The properties of residuals, such as their mean, variance and power are used to distinguish between normal and faulty operations. Using the static pump head equation, and the dynamic pump-pipe equations, the 4 residuals as shown in the figure can be computed. A healthy pump was run over a reference speed range of 0 - 3000 RPM in closed loop with a closed-loop controller. The reference input is a modified PRBS signal. The measurements for motor torque, pump torque, speed and pressure were collected at 10 Hz sampling frequency. Load the measured signals and plot the reference and actual pump speeds. Define operating regimes based on pump speed ranges. Estimate the parameters θ1 and θ2 in the static pump equation using the measured values of pump speed ω(t)and pressure differential Δp(t) as input-output data. 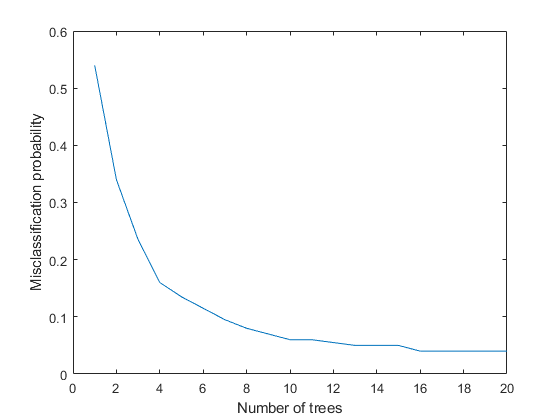 See the helper function staticPumpEst that performs this estimation. Estimate the parameters θ3, θ4 and θ5 in the pipe discharge flow equation Qˆ(t)=θ3+θ4Δp(t)+θ5Qˆ(t-1), using the measured values of flow rate Q(t)and pressure differential Δp(t) as input-output data. See the helper function dynamicPipeEst that performs this estimation. 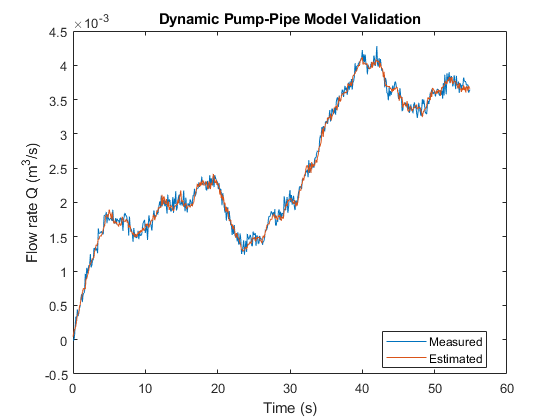 Unlike the static pump model case, the dynamic pipe model shows dynamic dependence on flow rate values. 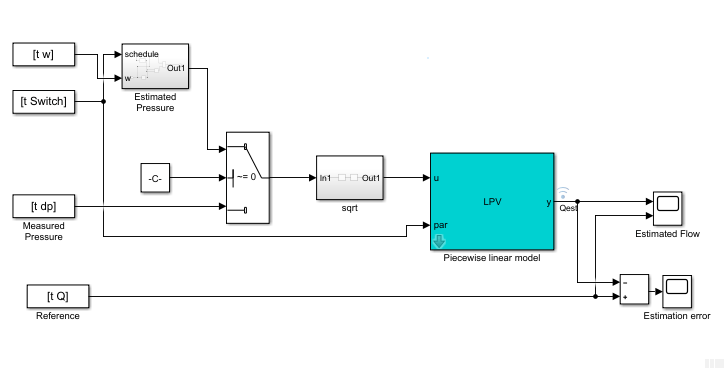 To simulate the model under varying speed regimes, a piecewise-linear model is created in Simulink using the "LPV System" block of Control System Toolbox. 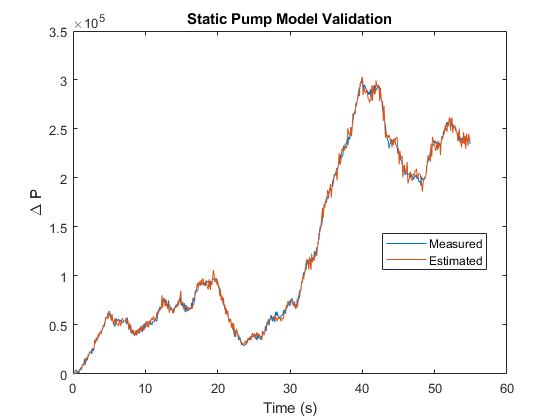 See the Simulink model LPV_pump_pipe and the helper function simulatePumpPipeModel that performs the simulation. The Dynamic pump-pipe model uses the same parameters identified above (θ3,θ4,θ5) except that the model simulation requires the use of estimated pressure difference rather than the measured one. Hence no new identification is required. Check that the estimated values of θ3,θ4,θ5 give a good reproduction of the pump-pipe dynamics. The fit is virtually identical to the one obtained using measured pressure values. The parameters θ6,...,θ10 can be identified in a similar manner, by regressing the measured torque values on the previous torque and speed measurements. However, a complete multi-speed simulation of the resulting piecewise linear model does not provide a good fit to the data. Hence a different black box modeling approach is tried which involves identifying a Nonlinear ARX model with rational regressors to fit the data. Model output is linear in regressors. Estimated using NLARX on time domain data. Define residue of a model as the difference between a measured signal and the corresponding model-produced output. Compute the four residuals corresponding to the four model components. For computing the inverse pump model residue, apply a smoothing operation on the model output using a moving average filter since the original residues show large variance. Residues are signals from which suitable features are extracted for fault isolation. Since no parametric information is available, consider features that are derived purely from signal properties such as maximum amplitude or variance of the signal. The feature of the residues that would have the most mode-discrimination power is not known a-priori. So generate several candidate features: mean, maximum amplitude, variance, kurtosis and 1-norm for each residual. 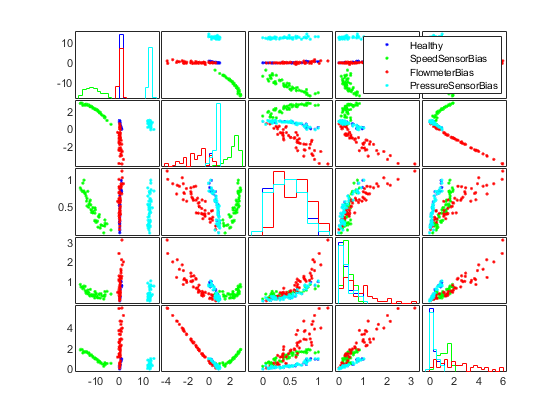 All the features are scaled using the range of values in the healthy ensemble. There are 20 features in each feature table (5 features for each residue signal). Each table contains 50 observations (rows), one from each experiment. Begin the analysis by visual inspection of the features. For this, consider Fault 1: Wear at clearance gap. 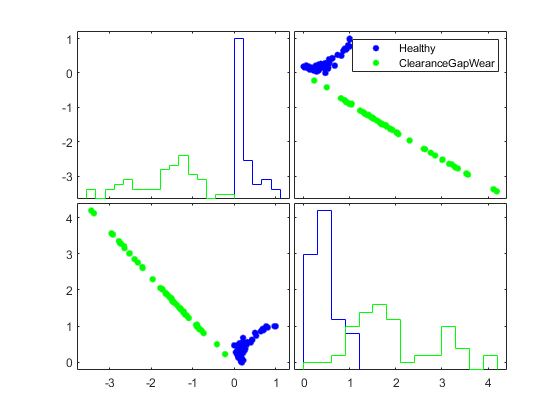 To view which features are most suitable to detect this fault, generate a scatter plot of features with labels 'Healthy' and 'ClearanceGapWear'. Although not clearly visible, features in columns 1 and 17 provide the most separation. Analyze these features more closely. The plot now clearly shows that features Mean1 and OneNorm1 can be used to separate healthy mode from clearance gap fault mode. A similar analysis can be performed for each fault mode. In all cases, it is possible to find a set of features that distinguish the fault modes. Hence detection of a faulty behavior is always possible. However, fault isolation is more difficult since the same features are affected by multiple fault types. For example, the features Mean1 (Mean of r1) and OneNorm1 (1-norm of r1) show a change for many fault types. Still some faults such as sensor biases are more easily isolable where the fault is separable in many features. For the three sensor bias faults, pick features from a manual inspection of the scatter plot. The scatter plot of selected features shows that the 4 modes can be distinguised on one or more pairs of features. Train a 20 member Tree Bagger classifier for the reduced set of faults (sensor biases only) using a reduced set of features. The misclassification error is less than 3%. Thus it is possible to pick and work with a smaller set of features for classifying a certain subset of faults. The previous section focused on manual inspection of scatter plots to reduce the feature set for particular fault types. This approach can get tedious and may not cover all fault types. Can you design a classifier that can handle all fault modes in a more automated fashion? 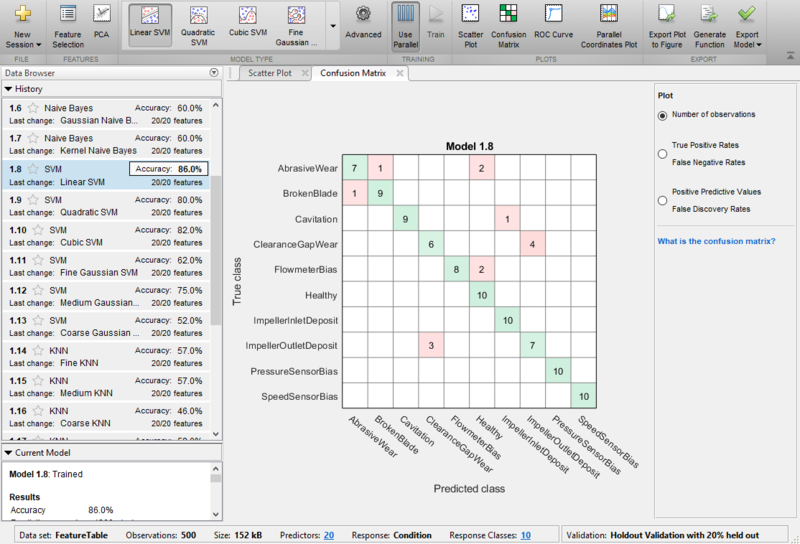 There are many classifiers available in Statistics and Machine Learning Toolbox. A quick way to try many of them and compare their performances is to use the Classification Learner App. Launch the Classification Learner App and select FeatureTable from workspace as working data for a new session. 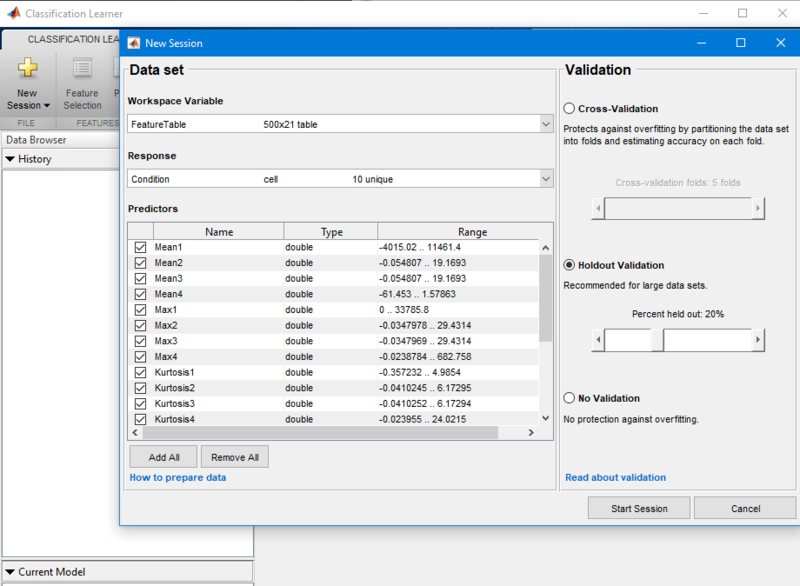 Set aside 20% of data (10 samples of each mode) for holdout validation. Select All under Model Type section of the main tab. Then press the Train button. 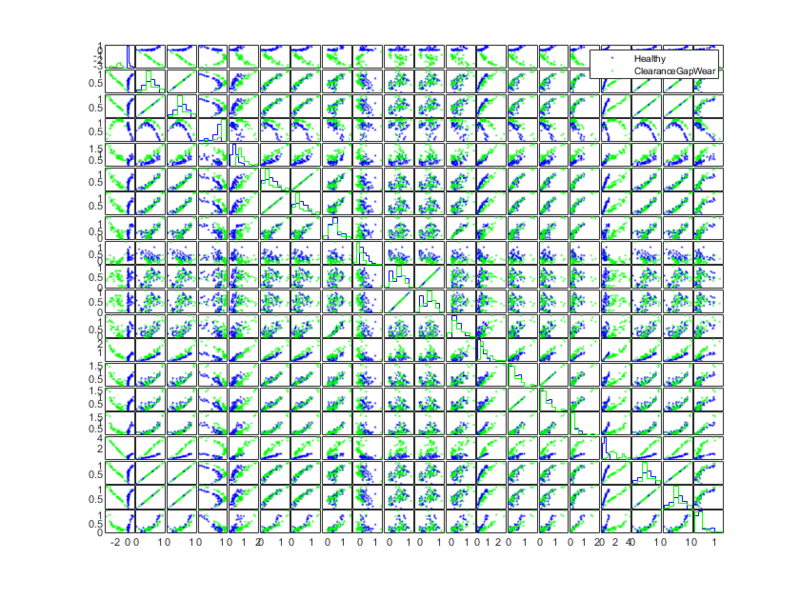 In a short time, about 20 classifiers are trained. Their accuracy are displayed next to their names under the history panel. A linear SVM classifier performs the best, producing 86% accuracy on the hold out samples. This classifier has some difficulty in identifying "ClearanceGapWear" which it classifies as "ImpellerOutletDeposit" 40% of the time. To get a graphical view of the performance, open a Confusion Matrix plot from the PLOTS section of the main tab. The plot show the performance of the selected classifier (the Linear SVM classifier here). Export the best performing classifier to the workspace and use it for prediction on new measurements. 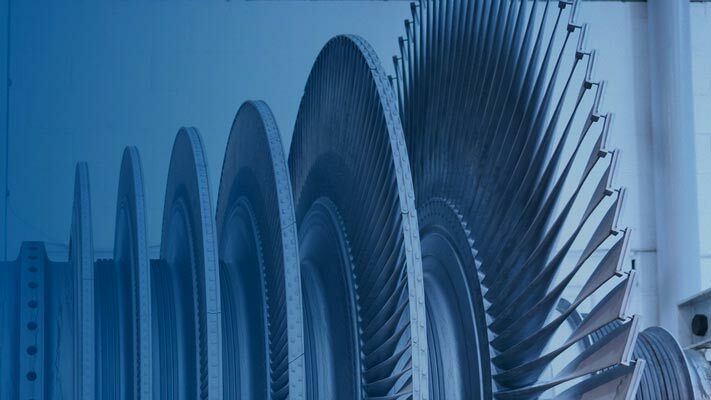 A well designed fault diagnosis strategy can save operating costs by minimizing service downtime and component replacement costs. The strategy benefits from a good knowledge about the operating machine's dynamics which is used in combination with sensor measurements to detect and isolate different kinds of faults. This example described a residual based approach for fault diagnosis of centrifugal pumps. This approach is a good alternative to parameter estimation and tracking based approaches when the modeling task is complex and model parameters show dependence on operating conditions. Model the dynamics between the measurable inputs and outputs of the system using physical considerations or black box system identification techniques. 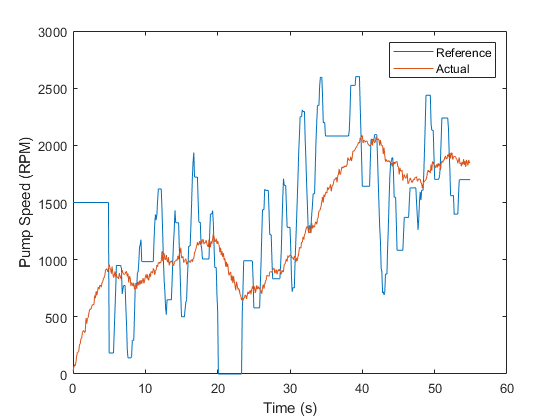 Compute residues as difference between measured and model produced signals. The residues may need to be further filtered to improve fault isolability. 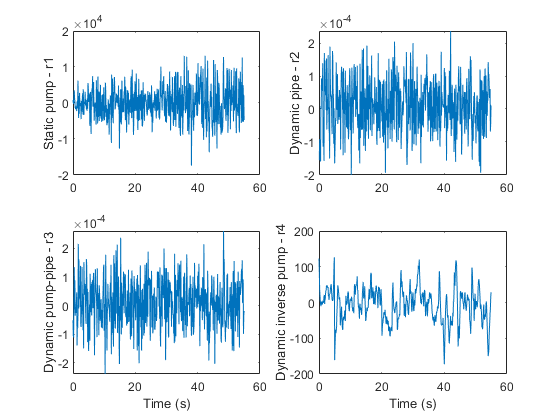 eak amplitude, power, kurtosis etc from each residual signal. Use features for fault detection and classification using anomaly detection and classification techniques. Not all residues and derived features are sensitive to every fault. A view of feature histograms and scatter plots can reveal which features are suitable for detecting a certain fault type. This process of picking features and assessing their performance for fault isolation can be an iterative procedure. Isermann, Rolf, Fault-Diagnosis Applications. Model-Based Condition Monitoring: Actuators, Drives, Machinery, Plants, Sensors, and Fault-tolerant System, Edition 1, Springer-Verlag Berlin Heidelberg, 2011. % I: sample indices for the selected operating region. Dynamic, multi-operating mode simulation of pump-pipe model using LPV System block. %simulatePumpPipeModel Piecewise linear modeling of dynamic pipe system. % th1, th2, th3 are estimated model parameters for the 3 regimes. % This function requires Control System Toolbox. 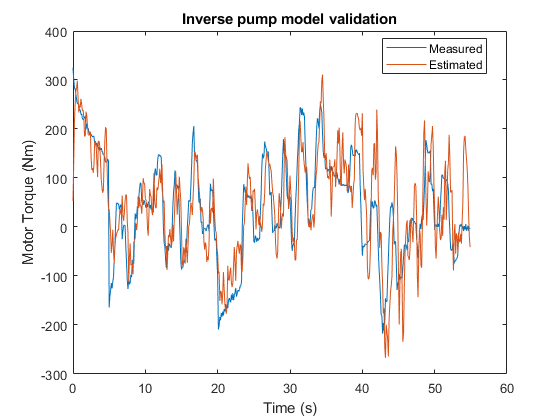 Identify a dynamic model for inverse pump dynamics. %identifyNonlinearARXModel Identify a nonlinear ARX model for 2-input (w, Q), 1-output (Mmot) data. % This function uses NLARX estimator from System Identification Toolbox.